Day 92: Eyesore or History?? As I do research on the photos that I have posted to find out more on the history of the architecture and locations that are featured, I have found that many people feel that parts of Chicago that hold historic value are considered an eyesore. Is this a common thought among Chicagoans or is this just the thoughts of a few? 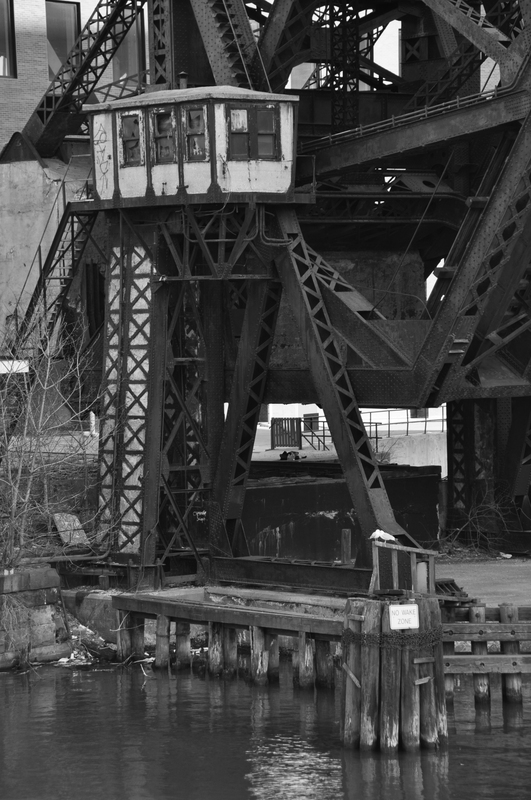 One are in particular that people tend to comment on being an eyesore is the site of the Kinzie Street Railroad Bridge. As someone who loves the history of Chicago, the old architecture and retired railroads, I look beyond the obvious fact that this particular bridge is considered a rusted metal structure and see the history that it holds. Up until 2000, this railroad bridge served a major purpose in the business of the Sun Times as this railroad bridge allowed train access to the Sun Times building to deliver paper. Not only did it serve a functional purpose, but it also was a bridge that set many records when it was built–being the heaviest and longest bascule bridge in the world. To me, this railroad adds character to the neighborhood and the image of the skyline and it would be a shame to demolish it.